Research suggests that added sugar is now the main source of sugar in our diets. 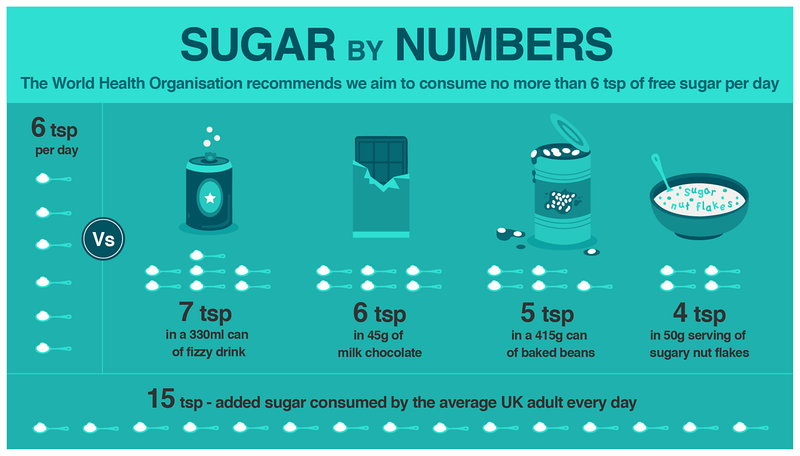 The World Health Organisation (WHO) strongly recommends we reduce our daily intake of free sugars to 5% of our total calorie intake (about 7 teaspoons per day). All sugar that is added to our food is classified as ‘free sugars'. They are easy to eat in excess, for example, you may drink a can of soft drink but you would not eat four apples in one sitting, as the fibre in fresh fruit makes you feel full. Free sugars are not necessary for a balanced diet. 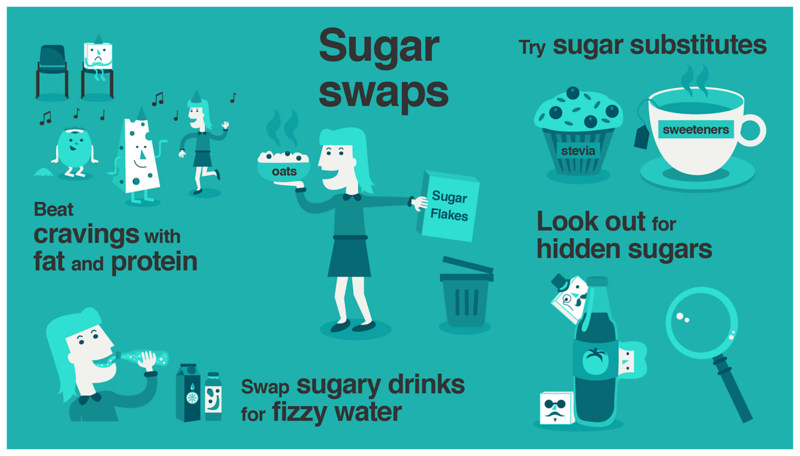 The recent 'sugar tax' has resulted in the reformulation of many fizzy drinks, but they are often still relatively high in sugar and some have the levels described above. A: No – honey is a free sugar too. When we think of sugar, we often think of table sugar, but it is a blanket term for sweet-tasting, energy dense carbohydrates. Table sugar consists of two simple sugars bonded together. These simple sugars are glucose and fructose. Honey is also made up of glucose and fructose. It is commonly believed that honey is a healthier alternative to sugar. This isn't true; honey is a sugar. Honey, maple syrup, agave nectar and rice malt syrup are all in the ‘free sugars’ club and need to be restricted. Q: What's the difference between fructose and glucose. A: The general consensus is that there is no significant difference between fructose and glucose in terms of their implications for health. All cells in the body can process glucose, whereas only the liver can process high amounts of fructose, which means that excessive consumption may tax the liver, but this is unlikely from a normal diet. It's suggested fructose interferes with proper functioning of some hormones, specifically ghrelin, which signals hunger to the brain and leptin, which generates a feeling of satiety. This may cause us to over-eat. Fructose has a lower glycaemic index than glucose, so as of 2015 food manufacturers in Europe who substitute other sugars with fructose can put a health claim on their products. Q: Why is it so hard to give up sugar? A: We associate sugar with pleasure, due to live experiences and a sugar 'high'. Throughout our lives we have associated sugar with pleasure. It is given as a form of reward and we consume it at celebrations. When we consume free sugars, they are quickly absorbed by our bloodstream and we experience pleasure and an energy boost. But then we have a ‘sugar crash’. These make us crave more sugar and the cycle of cravings and crashes continues. But just as we have learned to derive pleasure from sugar, we can also teach our tastebuds to enjoy foods that are less sweet. But this takes times, so stick with it. Q: How can I fend off sugar cravings? A: Train your brain to enjoy less sweet foods and have plenty of healthier snack alternatives at hand. Have healthy snacks, such as nuts and seeds, at hand. These are high in fat and protein, and so are useful for keeping hunger at bay. Enjoy small amounts of good-quality dark chocolate (at least 70% cocoa solids), which has a lower sugar content than milk or white chocolate. Add a sprinkle of cocoa or cinnamon to porridge to please your sweet tooth. Sugar alternatives such as stevia can be useful for sugar-free baking. Stevia is a natural sweetener derived from a plant. It is virtually calorie-free, does not affect blood sugar levels and does not cause tooth decay. But have caution that if you continue to eat sweet things, regardless if they are artificially sweetened, you will continue to crave sweet food. Often sugar cravings are a mental phenomenon based on the pleasure we get when we eat sugar. Distract yourself by taking a short walk, reading or listening to some music. Q: How can I check food labels for added sugar? A: Read the ingredients list and nutritional information per 100g. Food manufacturers don't have to state how much sugar they've added to food, but instead they give a figure for the total sugars. The traffic light system can help identify sugary foods; red sugar labels represent food high in sugar, amber represents medium sugar content and green signals low sugar content. But this system is based on total sugars, so some foods such as natural yoghurt may be labelled amber even though they contain no added sugar – just naturally-occuring sugar. Don’t rely solely on traffic lights; you also need to look at the ingredients list. Look at 'carbohydrates (of which sugars)' on the nutrition label. If the total sugar content is over 22.5g per 100g the food is high in sugar; if it is below 5g per 100g the food is low in sugar. Check where sugar appears in the ingredients list. If it is near the beginning of the list then the food is probably high in added sugar. Have a satisfying breakfast and be less prone to snacking through the morning. Love the flavour and comfort of a takeaway? Enjoy these lighter versions without worrying about the calories. More of a grazer? Try our collection of healthy snacks to keep hunger in check. Swap sugary breakfast cereals for one of these healthy, easy and filling options. Using fruit in baking reduces the need for refined added sugar. Here are 12 recipes to choose from. Swap ready-made sugary desserts for fruity jellies, chia puddings and light and low pancakes.